There’s this poster tube, wrapped up in newsprint (a travel section of the New York Times), resting against the wooden blanket chest in my bedroom. It’s been there for over a year- just sitting there, ready to be unwrapped, ready to be opened, ready to be used. The poster inside the tube was a birthday gift that I bought for my ex-boyfriend. In May 2013, he was still my boyfriend, and I had stumbled on a great gift: a 23×32 inch scratch-off poster map of the world. You grab a coin and scratch off the countries you’ve visited; after years (months?) of travel you’ll have spots of bright colors scattered across the map to reveal all of the places you’ve traveled to. I loved the map and thought it was perfect for my ex. In his twenties he’d been on a quest to visit all 50 US states, and since he only had Alaska left, I knew that he would soon start to travel internationally. When we were together, we often talked about all of the places on our “lists”: our dream travel destinations around the world. We planned the places we would see together, the adventures we’d have. The map was for him, but I knew that in the coming years, as he scratched off countries, I would inevitably be part of some of those travels. I ordered the map well in advance- his birthday was in August, and I ordered the map in early June. I needed the map early: I’d be driving up to Vermont- where my boyfriend lived- in early July, then flying to France for a month, returning back to Vermont for several weeks in August before finally coming back to Philadelphia. I planned to wrap up the map, leave it in Vermont and have it ready to give to my boyfriend when his birthday rolled around in August. These details are important because the map never arrived. Well, it did, but not in the way I expected. June was a flurry of activity as I finished work and visited friends and vacationed with my family and got ready for France. Around the end of the month it dawned on me that the map had never arrived, so I asked the handyman of my building if he had happened to see a poster tube arrive in the mail recently (the handyman is the partner of my landlady and they live in the main part of the house that my apartment is connected to. It’s a confusing and quirky building and mail gets mixed up, quite a bit). Recognition sparked in his eyes, quickly followed by a very, very guilty look. “That was for you? There was no name on it, just the address, we didn’t know who it belonged to.” He shifted on his feet, uncomfortable. “You have it then?” Already I knew it was a futile question. My handyman has a heart of gold, but also, at times, a careless attitude and complete lack of reliability. He wasn’t done yet, so I waited. I stared at him for a minute. I pictured it in my head: a rainy evening, one too many beers, a scratch-off map of the world at his fingertips. “It was a gift,” I mumbled. I didn’t know what else to say. He promised to order me another one, to overnight it. 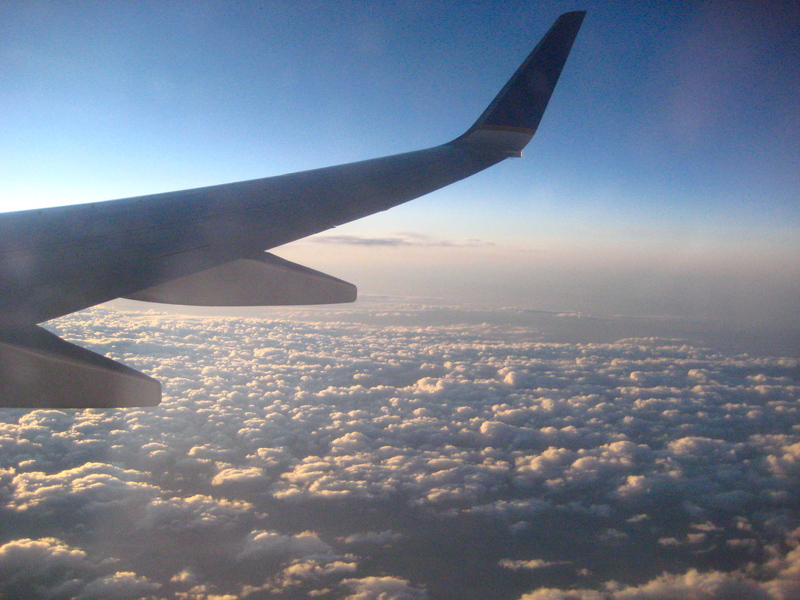 But it was the weekend, it was the 4th of July holiday, I was leaving for Vermont in a few days. I knew there was no way I would get it in time but he ordered the map anyway. It arrived at my apartment the day after I left for Vermont. So I didn’t have the map ready for my boyfriend’s birthday, but I figured I’d just give it to him the next time I saw him. At the time, there was no way I could have guessed that I would never see him again (that is just a slight exaggeration: I saw him only once after that summer, and at that point the map was the very last thing on my mind). I returned home in August, my relationship ended, the map sat, unopened, in the corner of my bedroom. All other traces of my relationship were tucked away: photos, stray CDs and books, notes and a stack of letters, a wooden cribbage board. I swept through my apartment and gathered up every reminder, packing most of them away in a box in the back of my closet. But I left the map in my bedroom, because I didn’t know what to do with it. It was too late to give it to my (now ex) boyfriend, I didn’t want to give it to anyone else, I didn’t want to throw it away. So I just left it there and figured that, eventually, I’d figure something out. And I have. It took about a year, but finally I figured out what I want to do with that map. That map is now MINE. Initially I thought that keeping it for myself would be too hard, that it would remind me of my ex-boyfriend, of all of those unfulfilled plans and dreams we’d had together. But time is a funny thing. I haven’t forgotten those plans and dreams- I probably never will- but they just don’t matter as much anymore. Because I’ve moved on. I’ve moved past that time, and life is about all sorts of new and exciting things again, and not about what I was supposed to share with someone else. And besides, the map sitting in my bedroom? That’s not the map I bought for my ex-boyfriend. That map was a soggy mess, scratched off by a drunken handyman and now buried somewhere at the bottom of a trash heap. My map is new and untarnished. My map was overnighted and expressly delivered. My map arrived a day late for my ex-boyfriend, but maybe it was never meant for him at all. Maybe this map of the world- a map full of countries waiting to be visited and scratched off- maybe that map was meant for me all along. Spain, France, Iceland: scratch, scratch, scratch. And that’s just the beginning. As if I know how to answer that question. Yes, indeed, how do you adjust back to regular life after a powerful and altering experience? I thought it wouldn’t be so hard. 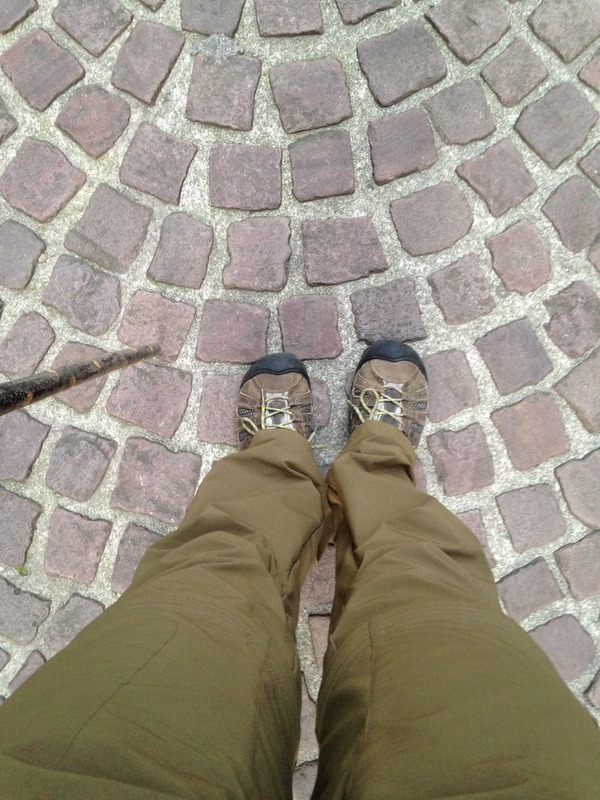 Before I left for the Camino, I was reading a lot of blogs from people who had walked, and something I noticed was that many people had trouble readjusting to regular life. I don’t think I’ll have a problem with that, I naively thought. I’m going to be so fired up about my experience that I’ll be able to make the changes I need to make. Or else, I’ll be so drained from all of the travel and movement and stimulation that I’ll want to come back home and just settle in. I wanted to settle into my regular life for about a week. I cherished the early morning hours of lounging on my couch and nursing a cup of coffee. I loved seeing my friends and my family, I loved being able to cook for myself and eat lots of vegetables. But then it got old. Fast. And all at once, about a week after I got home from my summer travels, I wanted to be back ‘out’ again. I wanted to be anywhere: on another Camino, traveling through Africa, exploring more of Europe, hunkering down in a small Spanish town and meeting the locals and learning the language. I wanted to hop in my car and take a cross-country road trip through the US, something I’ve dreamed of since I was 16. I wanted to spend a month on the coast of Maine, I wanted to spend a month crashing at my best friend’s place in Virginia. I wanted to keep experiencing things. I wanted to keep experiencing life. It’s a little over two months since I’ve returned home and I’m slowly getting used to this regular life, again. The intensity of the Camino has begun to fade a little at the edges, it’s no longer the first thing I think of when I wake up in the mornings. The seasons have changed and I’m accepting that I’m here, and no longer in Spain. When I first came home and strapped on my pack to go on a hike, I was frustrated that I couldn’t summon up my Camino feelings. What am I doing wrong? I thought. I have my pack, I have my shoes, I’m hiking through the woods, why can’t I feel like I did on the Camino? Because real life isn’t the Camino. It’s taken time, but now when I put on my pack and go on a hike, I enjoy the hours for what they are: a hike through the woods of a nearby park. It’s easier, in some ways, to be more content with where I am; the incredibly restless feeling that I had in August and most of September isn’t so present. And yet, I can’t just come back to life as if I never walked the Camino. I had that experience, and it affected me. So… now what? Over and over I think about the words I heard repeated so many times during the last few weeks of my pilgrimage: “Your Camino begins when the walking ends.” And for me, this is, I think, where I’ve finally encountered my biggest challenge. I loved my Camino so much, and as I think I said once before, in some ways it felt like the easiest and most natural thing I’d ever done. I knew, without a doubt, that it was the best decision I could have made for myself this past summer. I was happy and filled and energized. I was pushing myself and getting out of my comfort zone, I was examining the lessons that the Camino was giving me, I was thinking about where I wanted to take my life when I got home. I’m going to go on dates, all of the time! It won’t be nearly as scary or as awkward as I fear it will be! (How many times on the Camino did I have a coffee or a lunch or a drink or a dinner with a good looking European man? These guys just appeared out of nowhere, and it was such a confidence booster to know that I could socialize in this way. But now that I’m home? Where are all the good looking European men?? Why do I suddenly feel so awkward again??). I’m going to be active, and do so much more! Join clubs and groups, go out to bars and restaurants, meet new people everyday! 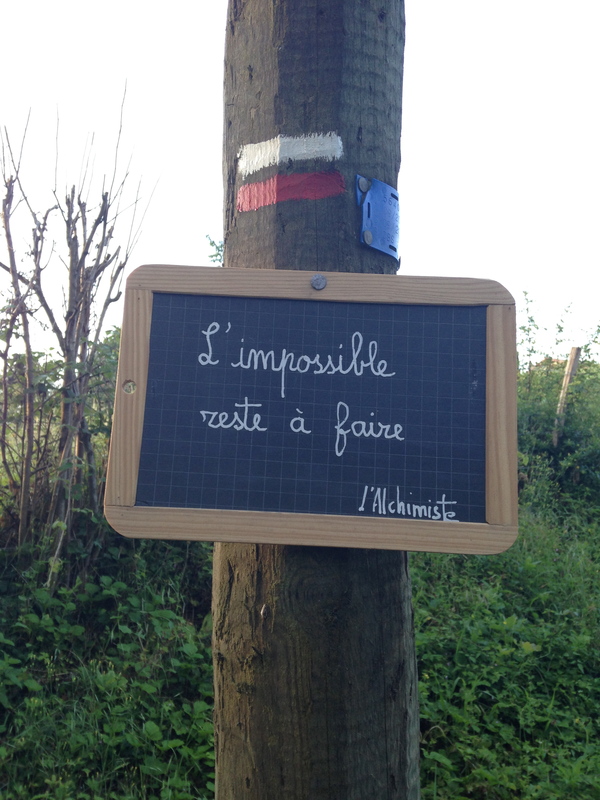 (The Camino makes you believe that, like dating, this could be possible and so easy. 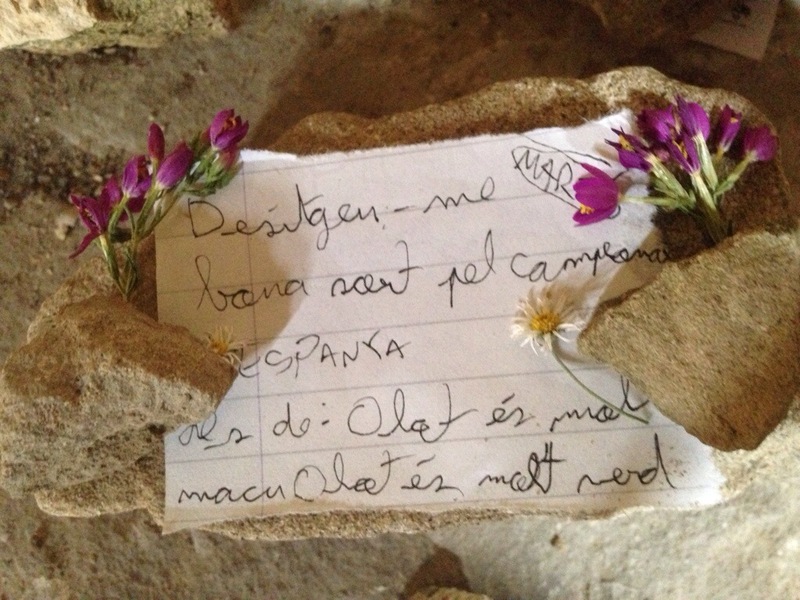 Because on the Camino, meeting new people everyday is easy. In real life, this takes effort. A lot of effort). I’m going to write a book! (I knew this with certainty on my third day of walking. I still know this and believe this, but now that I’m here, needing to sit down and actually write, I’m faced with the obvious but very real truth: writing a book is hard, hard work). So here’s the thing: I know that accomplishing anything- dating and falling in love, making new friends, writing a book- it takes a lot of hard work and dedication. The Camino, if you let it, teaches this to you better than anything: I walked 500 miles across a country this summer. It still feels incredible to write that. Is it true? I really walked 500 miles? I did. Each day I had to put in the work and the effort. I knew that I couldn’t get it all done in a day, or a week. It required time, and work, and sweat, and tears, and pain. I think that maybe anything worth it in life requires these things. So this is what is filling my mind these days: how to sit down and take the first steps with the next big thing in my life. How to live in the moment and let go of the endless planning and the worry and just take a risk and go for it. How to put in the daily steps even though the ultimate destination is still very, very far away. I did it on the Camino, and completing the Camino is proof- if I need it- that I can accomplish something big. So, how do I adjust back to normal life after the Camino? I’m not sure yet. Some days are great and fun and I love my routines and my home and my community; I love watching the falling leaves and grabbing a drink at Starbucks and cooking in my old and quirky kitchen. But some days my mind is filled with what comes next. I feel like I’m back in St Jean Pied de Port, holding my newly purchased walking stick that doesn’t feel comfortable in my hand just yet; standing in the middle of the street in the town and looking out into the distance and wondering if I’m going to be able to complete this journey. Here’s to first steps: scary and hard, but absolutely worth it. I just went for a short walk around my neighborhood, and fall is in the air. It’s the first time I’ve felt it: the cool breeze, the dusty glow of sunlight hitting a sky full of grey clouds. 7:00pm and the day is already fading. Fall, it’s a time of transition. It feels like a transition for me, although I’m not sure exactly what I’m transitioning to, not yet. For now, the only transition I’m working on is coming off of the Camino. I know where I just came from, but I don’t know where I’m headed to. It’s something I thought about a lot while on the Camino, and something I wondered if I would have answered by the time I left. I don’t, and it’s okay. For now, right here is good. I was driving to work this morning and merged in front of a large truck with a huge, yellow scallop shell on the side of the cab. I saw it and smiled. I turned on the radio and the first song I heard was The Proclaimer’s ‘I’m Gonna Be (500 Miles)’. “But I would walk 500 miles and I would walk 500 more,” sang the voice on the radio while a truck with a yellow scallop shell was barreling behind me. Oh, Camino. One of my blogging friends, Nathan, asked if I would be headed back for another Camino next summer. Man, if I could head back for another Camino next week, I would do it. Next summer? Maybe. 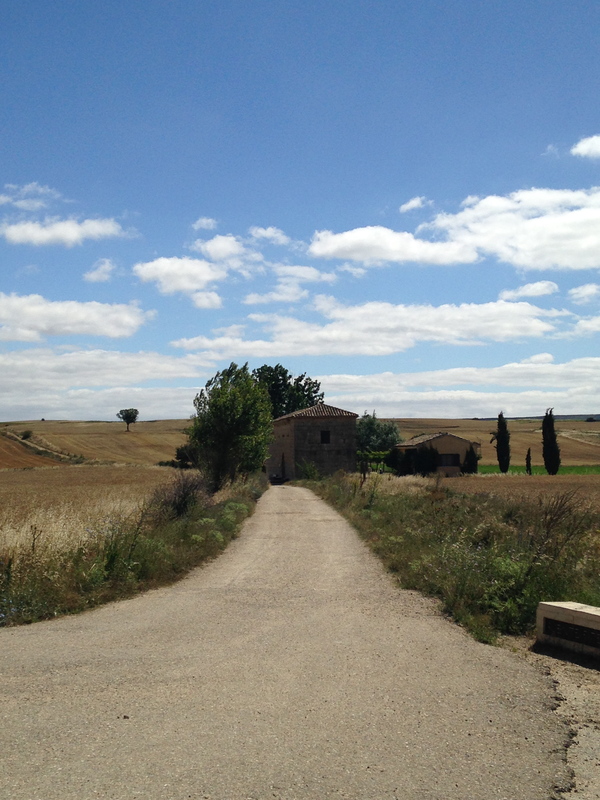 Doing another Camino feels inevitable, but a lot of life can happen in a year. It’s hard to say where my head and heart will be next June. What I think about right now, what I think about every day, is how I can write about this Camino. So I do write about my experiences, at least a little bit every day. I have a few ideas about where I can go with this writing, and maybe this is my yellow arrow, for now. Following the signs is a lot harder to do off of the Camino. While you’re on it, you just keep your eyes open for yellow arrows or yellow scallop shells, and you just keep walking. I never, ever worried about losing my way, even though I did get off track a couple of times. But I always found my way back easily enough- sometimes on my own, sometimes with a little help. Here, it’s harder to find the arrows. And sometimes you don’t know when you’re getting off track. Sometimes you’ve been off track for so long that by the time you realize it, you have to walk a long way to get back on the right path. But sometimes something will appear to let you know that you’re moving in the right direction. Sometimes it’s a truck with a scallop shell. Sometimes it’s a timely song on the radio. Sometimes it’s just a gut feeling. So I’m keeping my eyes open. Still looking for those yellow arrows, and trusting that I’m headed the right way. I left Hontanas with a spring in my step. It was- for me- one of those perfect Camino villages. Small, a couple albergues, one bar/restaurant where all the pilgrims sat and drank and talked, a pretty church, lots of character. I’d gone to bed the night before in a room of 8, sleeping on a top bunk next to an open window. There was a view of the village rooftops, a fading violet sky, a bright moon. That morning I’d woken early, shoved my things in my pack and went downstairs to the bar to have a cafe con leche and a croissant. One of my favorite things on the Camino was when a bar would be open by 6:30 so I could have coffee before I left for the day’s walk, and it was for this that I left Hontanas with a spring in my step. I was feeling good. Still adjusting to being without Mirra and for the first time (except for the beginning of my Camino through the Pyrenees), feeling like I was truly on my own. I was nervous, but I was also excited. 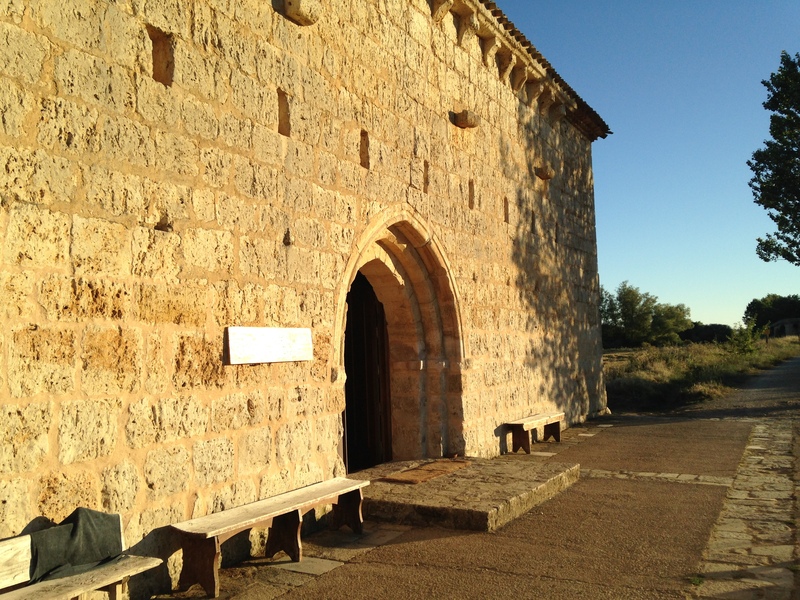 That night I would be staying in a place where, most likely, I wouldn’t know anyone: La Ermita de San Nicolas. 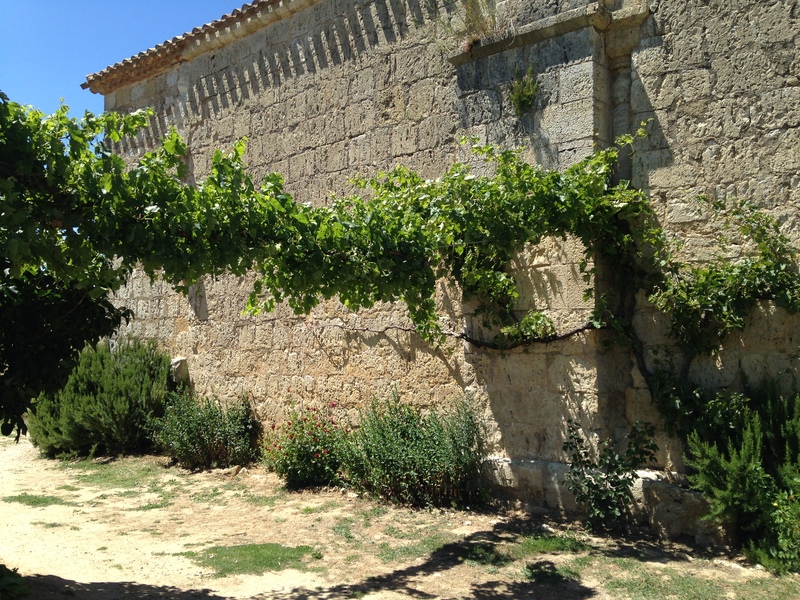 I’d heard about San Nicolas before leaving for my Camino, and it was on my short list of must-sees/must-dos. 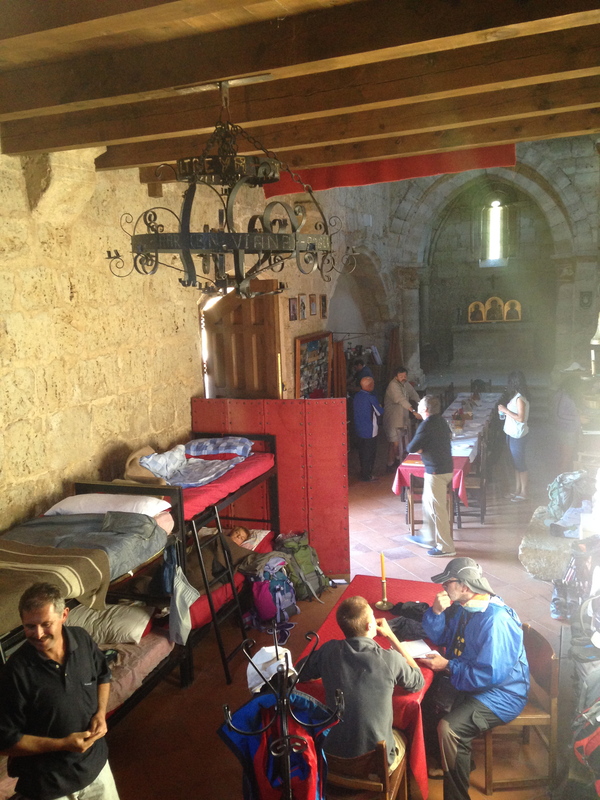 A 13th century church now converted into a pilgrim albergue, run by a confraternity of Italian men. The building had no electricity, there was a communal dinner with a pilgrim blessing, and some sort of ritual foot washing. I’d purposefully stayed in Hontanas the night before so that I would have a short walk to San Nicolas, ensuring that I would arrive early enough to secure one of the 12 beds. The morning walk was beautiful, and with the help of the cafe con leche, I sailed through the kilometers. I arrived at San Nicolas at 10:30, the earliest I’d ever arrived to my evening’s destination. On the door of a church was a sign that said the albergue would open at 3:00, but luckily the door was cracked so I pushed it open and stepped inside. Several pilgrims were there, looking around the building and getting stamps for their credentials. One of the Italian hospitaleros was there too, and he greeted me warmly. “I’m hoping to stay here tonight,” I explained to him. I smiled, thrilled that I would be able to stay for the night. As I spread my sleeping bag out on a bottom bunk, he came over and asked for my name. It’s a strange and unnerving feeling to be in the middle of northern Spain, standing in a small church surrounded by nothing but wheat fields and to be told that I was expected here, in this place. I’m still not exactly sure who this could have been. Possibly Etienne, a French guy I’d met the day before. We’d had our morning coffee together coming out of Burgos, and later ran into each other for lunch as well. He’d been walking for over a month at that point, having started in France, and averaged about 40 kilometers a day. I had told him that I planned to stay in San Nicolas, and we looked it up in his guidebook. He had left Hontanas earlier than me that morning, and so I suppose that as he was passing through, he might have stopped in San Nicolas and told the hospitalero that he knew a girl who planned to stay for the night. I never saw Etienne again, so I’ll never know for sure if it was him or not. But whoever it was, I was grateful. 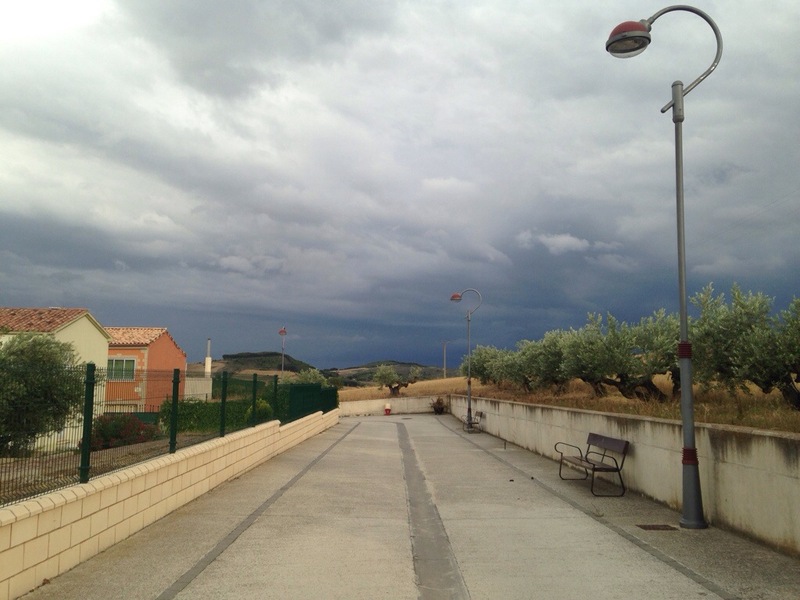 It was the first time on the Camino that I was branching off on my own, and I had walked into a place and instantly felt welcomed, and like I belonged there. So I stashed my pack and threw some necessary items into my day bag: flip flops, my fleece, bottle of water, can of tuna fish, bread, cheese, peach, spork, journal. I set off towards the nearest town, 2km away, planning to find a nice spot to eat lunch, and then hopefully a bar to have a coffee or a drink. As I walked a car drove past me, slammed on its brakes, then reversed to come back to me. The window rolled down and the hospitalero I’d spoken with 20 minutes before leaned out, asking me if I would like a ride. I only hesitated for a moment. As I’d been walking I thought that I would not only have to double back and walk these kilometers in reverse, but that I would walk them again the following morning. So when the offer of a ride came, I was tempted. I would still walk these Camino kilometers, but I would walk them the next day, as part of my actual Camino. The late morning and afternoon ended up being one of the best of my Camino. It was the first short day I walked, and it almost felt like a rest day. I found a shaded spot next to an old church to eat my lunch, and when I saw Ibai walking past I waved to him and he came to sit with me. I ended up walking further with him into the town and to a bar where we met up with Vinny and Vicool and Hyoeun and Jiwoo. They were breaking for lunch, and were tired. Sitting with them, I thought about how nice it felt to be done for the day, and how happy I was that I’d decided to stay at San Nicolas. I sat outside in the back courtyard with my journal, and throughout the afternoon people came to sit with me: Jerome, Alice, Rudy, an American from Chicago who I’d encountered a few times before. 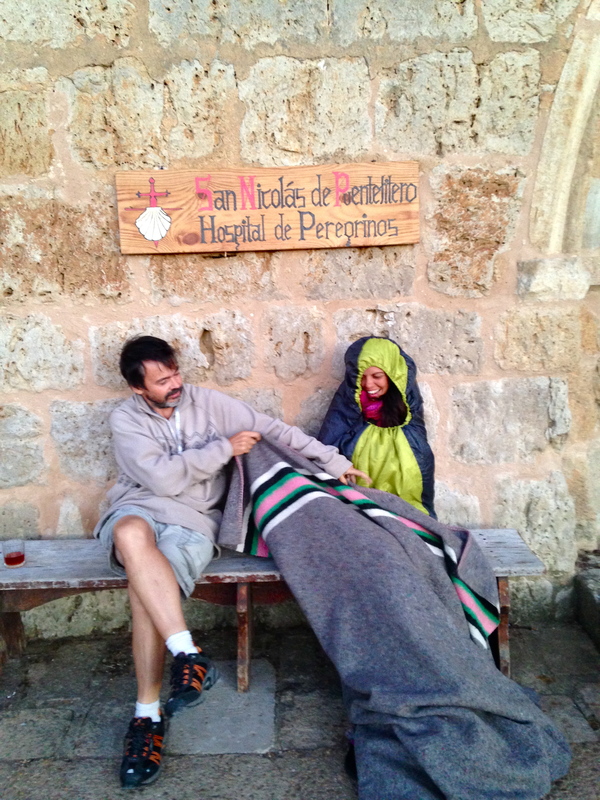 The caretaker of San Nicolas, an old man wearing a long, worn sweater, came over to me a few times. He only spoke Spanish, and I nodded along, trying to understand his words. 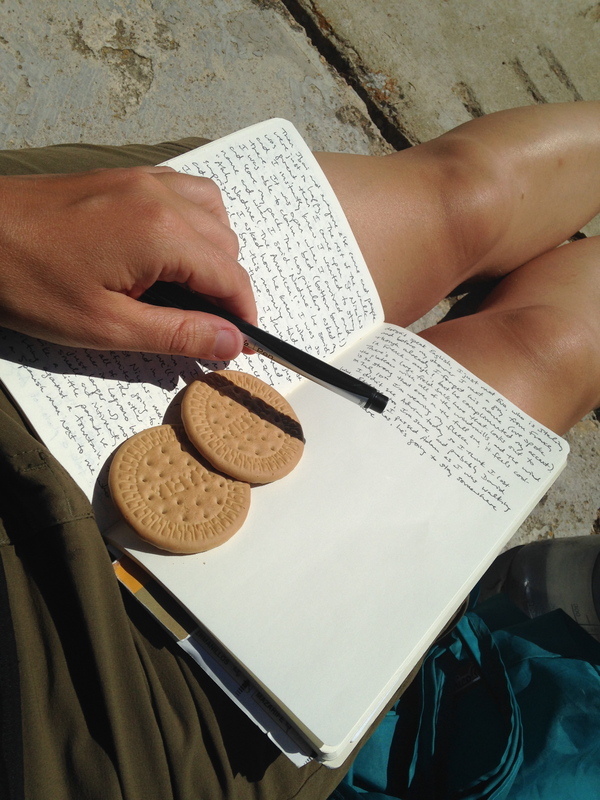 But it didn’t matter that I couldn’t understand; he smiled at me, then pulled several Maria biscuits from his pocket and placed them down on my journal. Pepe came over, squinting against the sun. “You’re a writer,” he said in his raspy voice. “Yes, I like to write,” I replied. And then he walked off, leaving me to wonder if this place, like some others along the Camino, held a bit of magic. Before dinner we sat in the altar of the church, in upright wooden chairs. Pepe and the other hospitaleros wore dark brown cloaks, and read a pilgrim blessing in Italian. Then the moved around to each pilgrim, asking that we place our right foot over a basin of water while they read a few words and rubbed a wet cloth over our feet. The night slowed down, quietly. At 10:00pm I stood outside, wrapping my arms around my body for warmth. The sun had set and there was a soft orange glow over everything. A wind blew through the wheat fields and it was all you could hear: we were alone. No buildings, no roads except for the Camino, no pilgrims passing at this hour. Alone, but exactly where I was supposed to be. I wasn’t sure if he was serious. But in any case, my pack was on my back, my shoes on my feet. Every day on the Camino I wanted to walk, and I did walk. It wasn’t time for me to stay put yet, even if staying put only meant a day or two. I walked away from San Nicolas, leaving before anyone else. Feeling strong, feeling at peace, feeling energized. Ready for whatever would come next. Day 6 of walking is finished, and I’m still feeling good. I walked a lot with Mira today, and we decided to finally go “off stage”, and do a little more than was recommended for today’s route. So we walked about 29 km from Estella to Torres del Ria, and we were commending each other for doing so well. The bulk of the walk was great, and it was just the last few kms, with the sun shining strongly and some road walking, that felt a little oppressive. I’m sitting on the terrace of the albergue where we’re staying. It’s a small place, in a small village, off of a side street and tucked away. The view out of the back looks past the church and onto golden weight fields. There is a storm in the distance, with dark grey clouds on the horizon and a cool wind blowing. 20 minutes ago, there was a sliver of a rainbow beside the church. Mira is sitting here, along with a Polish couple, and they are all writing in their journals. There are only 26 beds in this albergue and the place isn’t full; it’s a quiet and relaxed night, especially compared to the last few. Yesterday’s walk was from Puente La Reina to Estella- about 20km- and the scene at the albergue, once we got to Estella, was kind of crazy. It was a big municipal albergue, with about 75 beds, and most people that we’d met over the past 5 days were staying there. I think people are getting more comfortable with each other and more social; in any case, the Koreans were having wine parties, people were hanging out in the courtyard and the lobby, there was a lot of singing and laughing and merriment. I was enjoying talking to everyone. With each day I either meet someone new or have a conversation with someone I’ve seen along the way, and at this point, it’s hard to move through a part of the path, or an albergue, or a town, without stopping to talk to someone. I’d set up my bunk in Estella (top bunk, again), and was intending to take a nap or do some writing, but I never actually made it to bed. I walked into our room- which held 26 people- and started talking to Connor, the boy who walked his first Camino day barefoot, and is on this trip with his brothers and mother. Somehow the conversation turned to my hair and how much I wished I had some shampoo, and the next thing I knew he had gotten a small packet of shampoo from his mother and handed it to me. The three girls launched into accounts of their past 5 days: the things they hadn’t expected, how tough the walking was, how they missed being at home with their friends. I loved talking to them, and just like I had reminded Steve and Peg, the other night, of home, these three teenaged girls reminded me of my ‘normal’ life. I nodded in agreement. “It’s hard to sleep with all of these noises, isn’t it?” The girls all nodded at me, their eyes wide. “We never expected that it would be like this,” Emily said. I think about what it’s like for a 6 year old to do this walk, a 12 year old, a 15 year old. And any of my discomforts and concerns seem so small in comparison. The last two days of walking have been good. Yesterday was probably the hardest day; I walked over 6 miles before I had my morning coffee, and I was just grumpy by the time I found a town with an open bar. 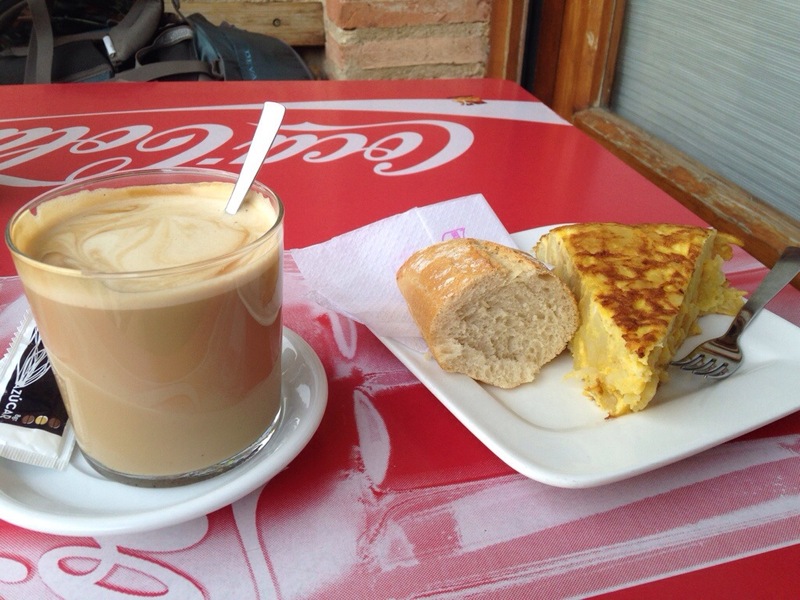 But then I had a very large cafe con leche, and the biggest piece of potato and onion tortilla that I’d ever laid eyes on (along with a piece of delicous bread). After that breakfast there was definitely a skip in my step, and the afternoon’s walk was good. The Italian guy, Paulo, has been walking with me, but I think I might have gotten rid of him today. He’s not a bad walking companion, but I’m not sure that he’s on this pilgrimage for quiet reflection. In any case, he caught up with a group of California girls who were giving him the eye, and I think he’s enjoying the attention. Hopefully, this means that I’ll have more solo walking time in the next few days. It still feels like I’ve been walking for weeks, rather than just 6 days. But I think that’s because so much life is packed into these days: the waking and the walking and the conversation. The food and the exploration and the connections. I’m still marveling that I’m walking across such a large space: that I can look behind me to see where I’ve come from, and know that this line I’m making, this path, will continue for a long time. I’m pretty excited to see what comes next. 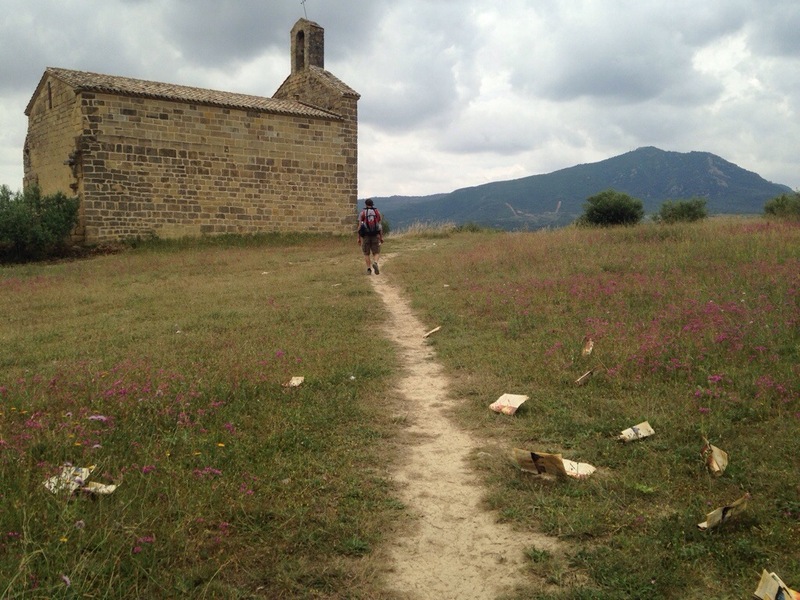 Why am I walking the Camino? Every day I think of new reasons, and at times I think that I must have 500: a reason for every mile I will walk. I started this blog to share my story of walking the Camino, but in these early stages, I’m struggling to know what to share. It doesn’t feel very exciting to talk about all of my pre-planning and my thoughts and my fears. I’m sure I’ll get into it all, and I suspect that as the summer approaches I will have Camino fever and want to write every day. But today? It’s a cold day in the middle of January and the Camino is still a far-off dream. It doesn’t feel real. I think about the days I will be spending, walking through a hot summer in Spain, and I can start to feel the heat of the sun and the burn in my legs, the weight on my back and the plates of food I’ll devour at night. I think about why I’ve decided to do this, why these images are in my head. And for the beginning of a blog, I can’t see a better place to start with than at why. 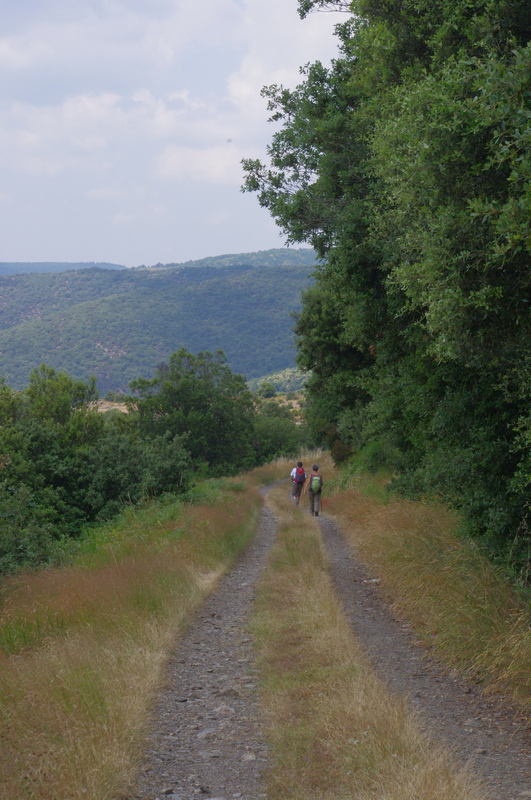 Reason #1 for walking this Camino is a big one: lots and lots of walking. I’m doing this Camino so I can walk. Walk every day, walk for hours, walk across a country. I love to walk and I love to hike. I don’t have a lot of hiking experience- I’m not a backpacker and don’t even have hiking boots. I don’t really know that much: nothing about elevation or gear or trail etiquette. But maybe that’s why I love hiking: you don’t need to know or have much to go for a walk in the woods. It’s not just the woods, either. Most days, I throw on some sneakers and head out my door to take a 30 minute walk through my neighborhood. I walk the same streets, day after day. I pass the same houses and the same neighbors, the same dogs who bound through their yard as I approach. I wave to the same mailman and jump over the same small puddle on the days when it’s rained. I thought I would have gotten bored years ago, but I haven’t. There is something therapeutic about being able to walk through a place I know so well, to know what my exact steps will be, to know where my legs will carry me. The Camino is going to be a different path every day, but I have a feeling there will be some consistency and routine in the walking. At the very least, there will be the routine of waking every morning, putting on my shoes, and stepping outside for a walk. Walking clears my head and it clears my lungs. I think when I walk, and I zone out when I walk. I listen to music, I listen to nothing, sometimes I listen to my own voice as I talk out loud. I nearly always feel better after I’ve gone on a walk or a hike. I feel alive and invigorated, but also settled and calm. Good, good feelings. I only have two days left in Labastide, and it’s not enough time. When I first arrived, I thought, “Three weeks will be plenty of time to do everything I want to do”, but now it feels like it’s not nearly enough. I don’t know what happens to the days here: I start my mornings on the terrace and before I know it I’m back there, eating dinner by candlelight. Time moves fast. Part of the problem (though it’s not really a problem at all) is that I can’t walk through the village anymore without running into someone I know. In the first weeks I would just smile and wave, now I stop and talk. People know my routines. If they see a blanket in my hand they will say, “You must be going to the rock.” At the end of the day, someone will ask, “Where did you hike to today?” The residents make an effort to gather together for lunch and dinner, and the other girls and I schedule time to sit in the library and talk. 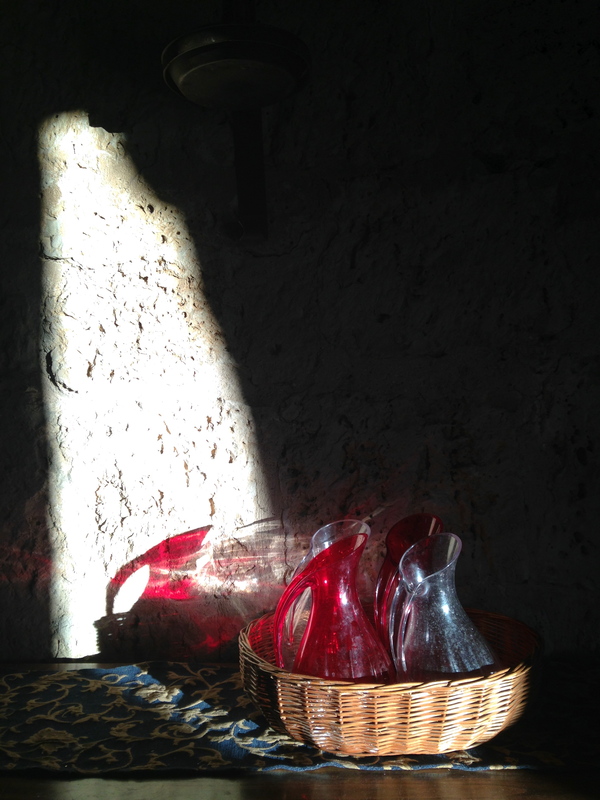 I write in the mornings and take, sometimes, a hundred photos during the day. I’ve explored this village and the mountains around it inside and out, and yet there’s always more to see. Just yesterday, a villager told me about yet another trail with a great view of the village. I added it to my list of things to do in my last few days, but the list just gets longer and longer. My days are filled with simple and wonderful things: a hike through the mountains with Filou, a village dog. One of the best cheeseburgers I’ve ever had at a cafe in Carcassonne. A village fête where we ate giant sausages and listened to the villagers singing French songs late into the night. Pointing out constellations on a clear night, as we sit on the terrace and see hundreds of stars. I’ve discovered a spot where I like to go and write, read, journal, or just sit and stare at the mountains. I came across it on my second day at La Muse, when I continued on the path past the church and cemetery. 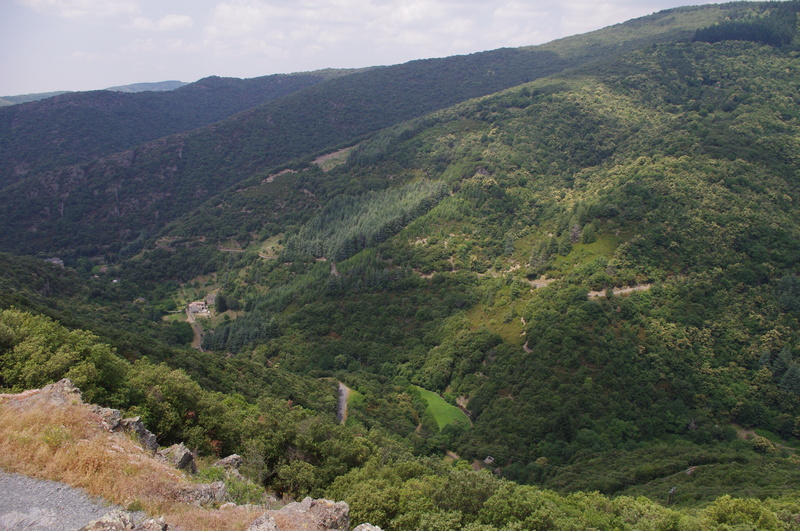 I hiked up an incline to where the path met a track, and after following this for a few minutes, saw a plaque that read “La Croix de Viallele”. Sure enough, there was a cross on top of a pile of rocks. I climbed up and took in the view, snapped a few photos, and vowed to go back. And I have, nearly every day. It’s a great spot to work- usually cooler and windier than in the village, and completely quiet and isolated. At least I thought it was. I was sitting up there a few days ago, with my notebook in my lap, when all of a sudden a little dog appears from behind the rock and runs over to me. He’s friendly: his entire body shakes when he sees me, and he runs all around, finally settling beneath my legs. I pet him for a few minutes, and as soon as I start to wonder where he came from, he runs off. Five minutes later I hear a voice calling out (in English): “Megan! Meg Meg! Where are you?” The voice moves closer and then I see a man standing on the rocks to my right, peering out over the valley. He hasn’t seen me yet so I take the opportunity to call over to him, “Excuse me, did you lose your dog?” I nearly startled the man straight off the mountain. Megan runs off again, so the villager follows, calling over his shoulder that I should come down to his cottage, meet his wife, and enjoy a lemonade or apéritif. I think about how I’ve stumbled onto someone’s very favorite place in the world. I can see why he likes it so much- after all, I saw it once and decided to go back every day. Do you have a favorite place? Somewhere that you go back to, time and time again? I leave for France on Tuesday, and I’m not ready. What does it mean, really, to be ready for something? My bags aren’t completely packed, but they will be, soon. I don’t have a detailed plan of work for while I’m there, but I have ideas, and I think that’s all I need. I’ve taken care of the details: flights and trains and hotels, money and plug adapters. My passport is practically glued to my hand, that’s now nervous I am about forgetting it. The other day, my grandmother asked me how to say ‘pull’ in French. I felt like the word was on the tip of my tongue; I opened my mouth to say it, but nothing came out. I searched through my mind, at first confident that I could find it. I couldn’t. It wouldn’t have mattered. What I learned in France during my first week abroad was equal to or greater than everything I’d learned in the classroom over the previous 7 years. I’ll go back to France and the language will be there. It will be around me, and it will be in my head. The word ‘pull’ might appear, effortlessly, along with all the others that have gotten lost. But this trip isn’t really about the language. I can focus on not feeling prepared to speak French, but that’s not what I’m really worried about. I’m worried about having three weeks to chase a dream, and wondering if I can do it. I’m worried about sitting down and writing. I’m worried about how to be an artist. I’m worried, but my excitement is a bit stronger. I’m excited about giving myself a chance to focus on a dream. I’m excited to see what happens when I sit down and write for three weeks. I’m excited to find out what kind of artist I am, I’m excited to let myself be an artist. Right now, I’m about as prepared as I’m going to be. It’s time to get to France and speak the language and eat the bread and take some photos and start to write. I’m excited to share this experience, because I think it’s going to be a great one.